Hi there, you operate a small business, do you have a website? Well, in today’s video we’re talking about what NOT to do when managing the content on that website. Stick around, I think you’ll find this interesting. Good Day. My name is Paul Barrs from PaulBarrs.com, thank you for taking the time to watch this video. Just a quick one today, I wanted to do a roundup of some of the common problems that I see when people come to me saying “Paul, can you help us with our website, we need you to help us upgrade it to make it work better.” I guess it’s that area of specialty that I fall into. Not getting the sales, not getting the conversions, not getting the traffic, whatever it is. But I see a common problem, a series of them and I’ve got six of them here on a list which I’m gonna go through with you today. So, what I’d like you to do is ask yourself this: am I doing these things, even some part, on my website? Because these are big mistakes, things that you should NOT be doing when adding content to your website. Number one on that list is adding theme content. 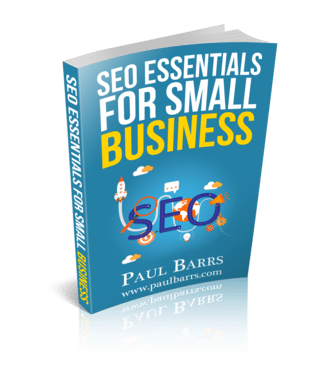 Now theme content is a term from an SEO expression, meaning the smallest possible amount of info that we can, to hopefully have some kind of result. Now, once upon a time it was permissible for us to be able to say, “Yeah, here’s a four hundred word article.” then “Okay, here’s a five hundred word article.” Oh God now then, it’s a six hundred word article and it just got more and more and more, then even that can still be thin content. What I think you should be doing instead is looking at the content on your website and asking yourself this: does it answer the questions of my visitors, my consumers, people who come to me looking to learn or to know something? Does it answer their questions and then does it also help to learn what else they might need to know about the topic, so usually it’s questions on a page and then more information on the topic. See, that’s not theme content. That’s not the simplest, smallest thing possible for hopefully some kind of result. Theme content has no place in today’s internet business world, not from an SEO point of view and certainly not from a consumer user experience point of view. The third thing on my list here today, things you absolutely should NOT do, is focus only on keyword content. Now, once upon a time back in the Wild Wild West WWW what we did was we did that keyword research and we went, “Yes I like this with search volume.” And we created the page on that and ahhh make sure we had keyword phrases in the heading, hmmm make sure it’s in the URL oh yes and we needed a button here and oh yes and the link here and don’t forget the H1 in the first paragraph, second paragraph all in Italic and bold and underline and ohh my Lord, really? That’s old school technology. Absolutely should not be doing that anymore but still some people focus too heavily just on that keyword phrase for that page. Really? Think back to what I said just a moment about the theme content, not just what they wanna know now but what else they also might like to know, dig a little bit deeper you will include your own keyword phrases on whatever you’re talking about because if you’re not talking about it it’s no good for the user. Yeah, but you’ll also include more information about the overall topic and that’s useful information. Number four of things NOT to do is – nothing. But sound effects will have the crickets playing right now. Do nothing! Look, I understand creating content on a regular basis it’s a damn difficult thing, it takes time, I’m doing some right now, I set aside the entire afternoon to record a series of videos which then become the foundation of my content. But I’ve got to set aside that time to do it. I’m actually about ten days behind when I would have liked to have done it but can’t just do nothing, I have to do something and it’s such a big, big problem for small business owners, “Oh I can’t do it!” “Ahh, I don’t know what to do.” “Ahh, I can’t do videos.” Did I say you have to do videos? No, but you DO have to do something. It’s so important. Number five things NOT to do, publish rarely. You can’t just… I mean, doing nothing is bad, but doing almost nothing is just as bad. There’s not much difference really. I want you to set up a schedule, an actual schedule maybe it’s gonna be once a month you’ll set aside two hours and you’ll create some content for the next month. However long it’s going to take, you must do it. I told my own coaching clients when I’m working with them that they need to set aside 30 minutes. The first 30 minutes of every single morning to work on that content for the online side of their business. “Ahh, I could not do that“. Look I got just to be honest with you here, as a small business owner, micro business whatever it is, if you cannot afford to take 30 minutes out of your business to work on your business you’re doing something wrong, seriously. 30 minutes off to have 30 minutes working on you need to do that, you need to find the way to make it happen. Do you have to be writing an article every time? No. Do you have to be recording video every time? No. You could just be doing research for what comes next, that’s okay it’s preparation. It is something you need to do, make it a habit. And lastly on this list, number six of things NOT to do… ohh boy you’ve seen this, I know I’ve seen this – published poorly written articles and I’m gonna use the phrase here “Asian or Indian English”, it’s not just the same. Too many people are outsourcing their article content creation, I’m talking the whole thing to Asia, to India or other countries where I’m talking here for my Australian to the business owners at the moment where English is not their first language, they’ve never studied in an English school just because you think they speak it and they can type it, it’s not the same and your readers will hear it. It’s usually grammar, poorly worded grammar and not just poorly worded it’s Asian English. It’s a different thing it’s a whole new ballgame. So, while you may be able to, you know, outsource some of that foundation work you need someone here back home or wherever you are England, Australia, Canada or New Zealand, Australia, I think I said that twice, hey I live here, I like it, it’s a good place. Wherever you are you need to have someone proofing that and typing it up and making sure it’s acceptable for your market place, your country wherever you are. Okay? 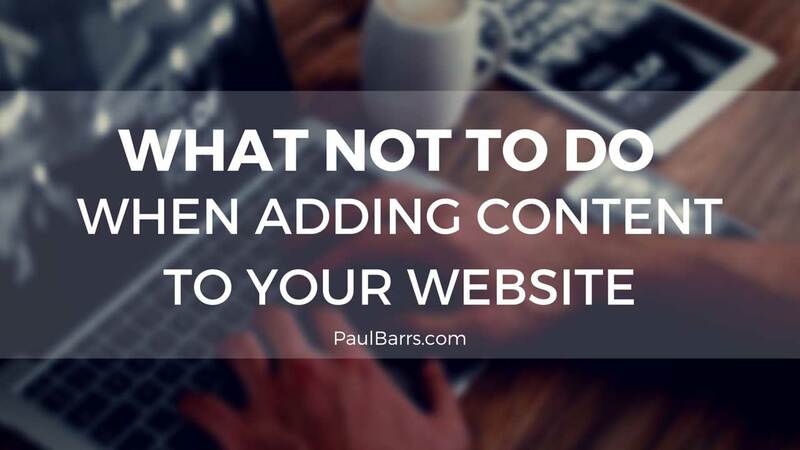 So that’s the short list, six things what NOT to do when adding content to your website. Hope you took some notes, had a list and got a few ideas, I hope so. Thank you very much for taking the time to watch this video. Come and join me again I’d love to hear and get your feedback. My name is Paul Barrs from PaulBarrs.com. See you soon. Bye.